To claim this earthcache as a find, please email or message the answers via my caching profile. Failure to submit answers will result in logs being deleted without notice. Woodford is a large village and civil parish in East Northamptonshire. It is in two distinct parts, the easterly, lower, part being alongside the River Nene and the westerly, upper, part is on the through road out of the Nene valley. The oldest construction in Woodford is out to the west at one of the highest points in the parish. Near the parish boundary with Great Addington are some historic barrows. There is insufficient evidence to date them properly, however, they are thought to be Neolithic (c 3000BC). Known locally as Three Hills they are easy to see from the road. A number of Roman artifacts have been found in the area now occupied by Church Street. 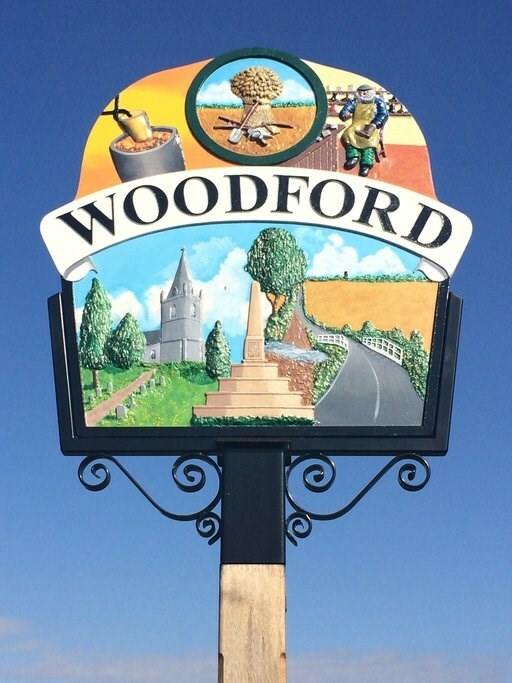 The name Woodford immediately suggests that the village was named after a wood and a ford. The village still has a wood and a ford. The ford however, is more than a mile from where the settlement is most likely to have started (in the area now known as Church Street), and the wood (known locally as The Shrubbery) cannot be described as ancient woodland. Records suggest that it was planted around 1700. The village most likely was named after the wooded slopes of the valley that most probably existed 1000 years ago and possibly a ford across the river. (The Ancient Rockingham Forest extended to the River Nene at that time). The river was obviously not controlled and would have been bordered by marshland and reed beds. Anecdotal evidence suggests that even as late as the 1950s the river was quite shallow near the Church (in comparison to other parts) which could suggest there was some sort of crossing at this point. Additionally this is very close to the green lane which extends across the fields from Ringstead and stops rather abrubtly one field away from the river. During Saxon times (800-1000) a system of open fields was laid out. This later evolved into a three-field system whereby crops were grown in two fields on a three year rota enabling a different field to remain fallow. Each villager would have had strips of land in each field and some would also have had grazing rights. Some of these strips of land became a series of low ridges caused by ploughing which mounded the soil to the centre of the strip causing a dip between each strip of land. There is still evidence of this type of farming in the Leys and can be viewed if one walks across the field from Newtown to either the end of Rose Terrace or Whittlesea Terrace. A further example was evident in the field now occupied by Paddock Road and Windmill Close. Eventually it became apparent that this type of farming was inefficient and a series Enclosure Acts were passed by Parliament. This practice gained momentum during the reign of King George II (1727-60). The Woodford Enclosure took place in 1764 different areas of land were enclosed by hedges and fences and divided between 44 owners. A copy map of the field system is on display in the Church and also at the Northamptonshire Record Office. The original is at Boughton House. 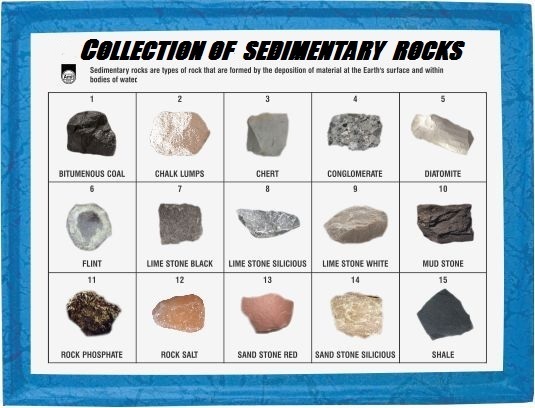 Sedimentary rocks are types of rock that are formed by the deposition and subsequent cementation of that material at the Earth's surface and within bodies of water. Sedimentation is the collective name for processes that cause mineral and/or organic particles (detritus) to settle in place. 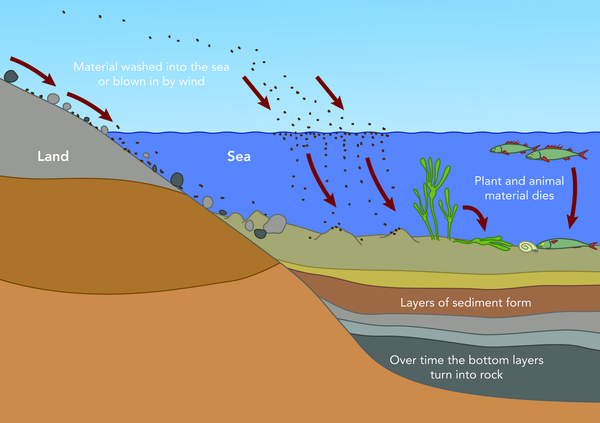 The particles that form a sedimentary rock by accumulating are called sediment. Before being deposited, the sediment was formed by weathering and erosion from the source area, and then transported to the place of deposition by water, wind, ice, mass movement or glaciers, which are called agents of denudation. Sedimentation may also occur as minerals precipitate from water solution or shells of aquatic creatures settle out of suspension. Among the three major types of rock, fossils are most commonly found in sedimentary rock. Unlike most igneous and metamorphic rocks, sedimentary rocks form at temperatures and pressures that do not destroy fossil remnants. Often these fossils may only be visible under magnification. Dead organisms in nature are usually quickly removed by scavengers, bacteria, rotting and erosion, but sedimentation can contribute to exceptional circumstances where these natural processes are unable to work, causing fossilisation. The chance of fossilisation is higher when the sedimentation rate is high (so that a carcass is quickly buried), in anoxic environments (where little bacterial activity occurs) or when the organism had a particularly hard skeleton. Larger, well-preserved fossils are relatively rare. Brachiopods have become all but extinct in modern seas and oceans, but in the geological past they flourished at the shallow margins of oceans, especially in the Carboniferous. At first they appear little different from familiar modern-day sea shells, but they are in fact quite distinct, with different shell and soft part anatomy. Many brachiopods lived openly on the sea bed, but some such as Lingula, occurring near the base of the Carboniferous Limestone, inhabited burrows. Two important groups of brachiopods in the Carboniferous are strongly radially ribbed forms, called spiriferids, and large, less strongly ribbed forms with relatively plano-convex valves, called 'product ids'. Crinoids inhabited shallow water and grew in dense clusters, sometimes called 'crinoid gardens' because of their resemblance to plants. Long stems were anchored to the sea bed, and held aloft a globose, cup-like structure with radiating arms. The whole animal is formed of many individual plates that usually become scattered when the creature dies. The stem plates are common fossils and the main constituent of crinoidal limestone. Like modern-day coral reefs, the abundant remains of fossil corals in the Carboniferous limestone suggest the former existance of warm, clear, shallow and well-lit tropical seas. Corals have a variety of branching and encrusting shapes that provide homes for other creatures and act as a baffle to trap sediment. Different kinds of fossil corals occur at different levels in the limestone, allowing geologists to distinguish between older and younger beds. (1) Describe the rock that the plinth is made from, its texture, colours and what minerals its composed of? (2) What sedimentary rock do you think this is? (3) You will see a number of fossils in the rock, what is the size in mm of the largest fossil you can see? (4) Describe the fossils and what do you think they are? (5) Not compulsory but it would be nice if you can upload a photo of yourself or GPS at GZ.